Why your Organisation needs ISO Certification Training? You must be aware as how important it is to have an ISO certification. To build high level of customer satisfaction and reliability for your products and services, you must have an ISO certification. This certificate shows that your organisation is following all the rules and regulation as well as every safety norm. As a result of which, a customer develops high level of reliability and trust in your products and services. Now, you must be thinking of having an ISO certification, but the procedure of getting an ISO certification could be daunting if you do not have a professional to guide you. Global Manager Group has the knowledge of what it takes to provide ISO certification at an instant and with ease. Let it be ISO 9001 certification or ISO 17025, ISO 27001 or ISO 14001 training, Global Manager Group is an expertise in providing all kinds of ISO certifications. Getting an ISO certification is a lengthy process, but with Global Manager Group, you could get it with ease. Global Manager Group follows the set procedures. It ensures complete transparency to familiarise you with the internal environment of ISO auditing. Moreover, it is very helpful, as various flaws in your organisation can be sorted out before the ISO auditors perform audits. Most of the organisations have flaws in production and manufacturing processes. They ignore certain important norms and this is why they get rejected in getting an ISO certification. With Global Manager Group, you can assure that every norm and condition is followed at its optimum level. Coming to the Global Manager Group?? ?s strategies for providing ISO certification training, it follows some core factors that make the working and training procedure smoother and hassle free. Improvising quality system standards and their applications: Here, Global Manager Group ensures to provide you internal knowledge for having the best quality output with a cost-effective approach. In addition, they will guide you to the various applications that play an important role in improvising the quality as well as retain the level of investment. Internal Auditing: This unique strategy from Global Manager Group helps you meeting the expectations of ISO auditors, so that you can fulfil all the requirements well in time before the real ISO auditors perform their auditing task. With this, you can minimise the flaws and reach to the next step for ISO certification. Professional Auditors: Global Manager Group employs ISO auditors, who are well-experienced to guide you till the end of the procedure. With professional auditors from Global Manager Group you can ensure high level of guidance to ISO certification procedure and they will train you in such a way that you get the certification at instant. Globalised Services: No matter from what part of you world you are, you can reap the benefits of services provided by Global Manager Group, as it spreads services in USA, UK, South Africa, London, Canada, Saudi Arabia and other parts of the world. ISO Certification Training – Why it is Important? Clients as well as customers prefer companies with ISO certification. Certificate from ISO signifies the high quality as well as ease of safety of the product. Therefore, it is important for all companies to have ISO certificates in order to earn the reliability of clients as well as customers in their products or services. However, getting an ISO certification can be a daunting task, if you lack expert guidance with you. Standards of ISO auditors are very high and to meet all their requirements, it is best to hire an agency that is best in dealing with your ISO certification task. Even though ISO certification is not a mandatory process by government, but most of the industrialists are going for this in order to create credibility for their companies among the customers and sustain in this competitive world. Global Manager Group is the best agency providing effective training in the field of ISO certification. The certification from ISO is of various types like iso 14001, iso 17025, iso 27001, six sigma and the most common iso 9001. ISO 9001 certification represents the effective and efficient quality management of a company. Global Manager Group provides expert ISO 9001 audit training so as to get the certification from ISO officials at first attempt. ISO certification training from Global Manager Group assures prior auditing process complying all the ISO standards. The demo auditing from the experts of Global Manager Group helps in getting the gaps in the production process. Global Manager Group?? ?s experts detect the faults and then the reports of such faults are presented to the company. It is now the duty of the company to eliminate such faults from its production process. After this, ISO auditors do the audit work and the companies get the certification at first attempt. ISO 9000 standards certifications ensure that the organisation is meeting the quality management system. Main objective of ISO 9001 certification is to create a standard in quality management system. For getting ISO 9001 certification, organisation must prepare a record that efficiently and correctly describes the whole process of production and quality management system. This document must contain quality manual as well as quality policy of the production process in the organisation. Among several accreditation bodies providing training for ISO certification, Global Manager Group is the most popular, reliable and credible of all. It has experts, who understand the standards required for getting an ISO certification as well as provide guidance to its clients throughout the process of ISO certification. Global Manager Group is considered as one of the most reliable agencies no only in UK, but also in USA, Saudi Arabia, South Africa and in many more parts of the world. Taking risk with precaution is always a smart choice. Business is a risk and having ISO certification is an advantage for the product, shareholders and customers and for the businessperson too in establishing the system and making vibrant organization. ISO standards are internationally known set of requirements for any administration that defines processes and control set which helps you to meet all stakeholders, legal requirements further reducing risk in your business for Quality, Environment and OHSAS issues. Global Manager Group is here to assist you for acquiring certifications according to your business requirements. You can simply come to us and give in all the required details about your company and for the rest you can rely on us. Our best on line options are providing on line help by arranging webinars, providing training through our virtual university and providing ready to use documents for your organization after making online micro level survey of your organization with our established Knowledge based outsourcing system for establishing the system for any type of the organization in the world. If you are looking for improvement in the way of managing and operating your organisation, then go for ISO 9001 certification. Implementing it at all sectors of your organization can earn you good investment returns. 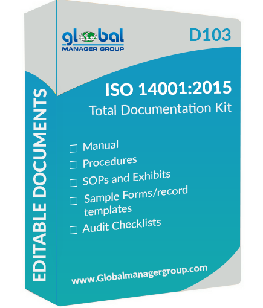 Global Manager Group also provides you with ISO 14001 training in which we create a basic awareness among your employees about environment management systems to meet the standards of ISO 14001. Any organisation providing services or products needs to look after an effective system for quality management and is the basic aim of ISO 9001 program. Global Manager Group will assist you for acquiring ISO 9001 certification. We also provide ISO 9001 audit services for you to implement effective quality management system. The main aim of ISO auditor training is all about conveying the skills and knowledge and we provide online certified internal auditor training for ISO 9001, ISo 14001 and OHSAS 18001 which are essential to conduct internal audits in an organisation. Thus, if anyone desires to conduct audits internally in an organisation, then that person needs to pass the ISO auditor training. Global Manager Group takes pride in offering excellent ISO auditor training to meet these requirements. To achieve improvement in quality of the organization, six sigma certification must be obtained. Global Manager Group helps you to identify and alter the mistakes by reducing the inconsistency that might occur in the industry procedures with its six sigma certification. Six sigma helps in the management and output of quality for a business organisation. In fact, dedication of employees at every level towards the six sigma system is of utmost importance. Global Manager Group provides six sigma certification assuring enhancement in quality and growth of the business. Global Manager Group is not only a renowned ISO certificate provider in UK, but it also spreads its services in USA, South Africa, London, Canada, Saudi Arabia, Qatar, UAE, Australia and other parts of the world. Thus, businesses in need of ISO 14001, ISO 9001, ISO 27001, ISO 17025, ISO 22000, ISO 50001 certifications as well as related ISO audit training and six sigma certifications can turn to Global Manager Group, as it suffices to all your ISO certifications, training and auditing needs successfully.